X-PACK is a Tunisian company which has developed more than 100 references of plastic packaging for the last 10 years. One major business is the processing of high-density polyethylene (HDPE) to produce reliable closures for the packaging industry. With a big investment in two new injection moulding machines for 150 tons and a material consumption of 18 kg/hr, X-PACK was looking to grow in the market. To be able to do that, the machines have to run at their maximum production last and any production stop affects the productivity and causes huge loss. Mohamed Amine Abid, Director of X-PACK, says: „We had some production breakdown in the past due to a metal contamination and we did not know where it came from, apparently was mixed in the raw material. After that we decided to protect the hot runner system to avoid a major disaster“. Two PROTECTOR 40 PRIMUS+, to direct installation as Last Chance Control were the solution for this customer´s problem. Small metal particles in the plastic melting process often result in costly breakdowns of injection moulders, extruders and blow moulders. The quantity of such metal contaminants increases throughout the processing of regranulates and grinding stock. As a result, clogged nozzles, filters and hot channel systems can lead to production downtime. The metal separator PROTECTOR is installed directly over the feeder of an injection moulder, an extruder or a blow moulder. It detects all magnetic and non-magnetic metal contaminants (steel, stainless steel, aluminium, etc.) – even when they are enclosed in the product. 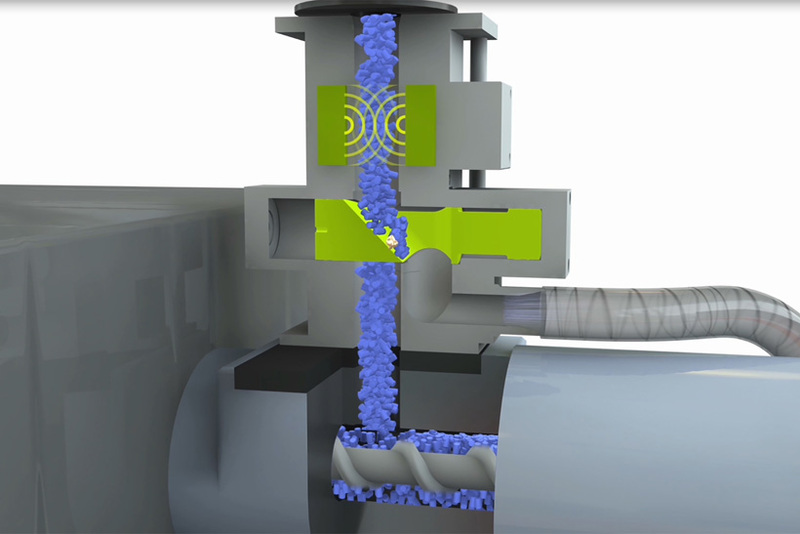 Metal contaminants are rejected via the “Quick-Valve” separation unit. Metal separators protect the processing machines, prevent malfunctions and thus increase the running time.